Why does hyperglycemia affect sodium levels? How to calculate corrected sodium? What is the corrected sodium formula? 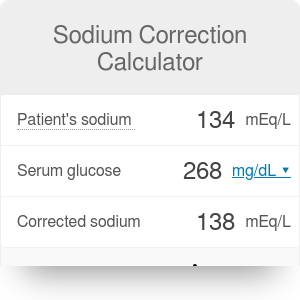 This sodium correction calculator fixes the results of serum sodium (Na⁺) measurements that can be a little distorted in states of hyperglycemia. The values needed for the estimation are the patient's serum sodium and their blood glucose. Read on to learn how to calculate corrected sodium and to understand the formula for sodium correction. If you find this calculator useful, check out our other sodium-related tools: sodium deficit, Fractional Excretion of Sodium (FENa), free water deficit, and anion gap calculator. In the state of hyperglycemia - high blood sugar concentration - water moves from the intracellular to the extracellular space to dilute the excess glucose. This shift can cause a relative decrease in serum sodium level. Insert the patient's serum sodium level (Na⁺). If the test results are in mmol/L, they are equal to the values in mEq/L. Type in the blood glucose level in the preferred unit. You can change it by clicking on the unit symbol. You can also use our glucose unit converter. The calculated corrected sodium is presented in the last field. If you'd like to see what's the result when using an older version of the equation, click on the advanced mode button. If you're planning to correct the patient's hypo- or hypernatremia, use our sodium correction rate calculator. The equation was developed by Dr. Teresa A. Hillier and described in the article Hyponatremia: evaluating the correction factor for hyperglycemia in 1998. In the advanced mode of the calculator, you can find an older version of the corrected sodium formula. It is an equation developed in 1973 by Dr. Murray A. Katz - Hyperglycemia-Induced Hyponatremia — Calculation of Expected Serum Sodium Depression. Sodium Correction Calculator can be embedded on your website to enrich the content you wrote and make it easier for your visitors to understand your message.